This is a referral service only. The dogs listed on these pages have not been prescreened for health, temperament or behavior problems. It is the responsibility of those who inquire about the dogs listed below to get all the information they can and be able to accept responsibility for their adoption of a specific dog without holding any other party responsible if there is a problem with the rescue.We ask for donations for all rescues but most especailly for the ones under the age of two. CLICK ON PAGE AND Click "GO"
Link to a video depicting more boxers being boxers. Whatever age or breed of dog you adopt. Whether the dog is all ready trained or not. TRAINING, with you, is the MOST IMPORTANT part of the adoption process. A dedicated training program, whether it be with an instructor or dedicated training on your own, will help the bonding process. Training will help the dog learn how to understand what you want and the communication process will get off to a good start. Once you and your new friend are communicating your future together will be much brighter and your prospects of working & living together will be limitless. Rescue is a wonderful way to give a deserving dog a good home. But it is also a commitment. The dog will need leadership, training, discipline and, then and only then, your affection. 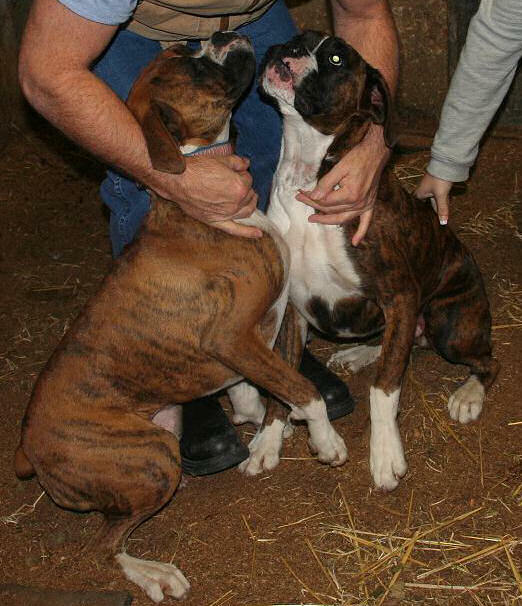 Many of the boxers that wind up in rescue are there because of lack of training. Granted some, are there because of other circumstances. 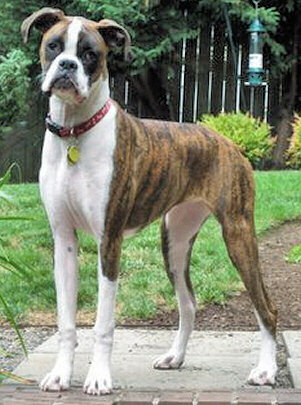 It is very very rare to see a nicely trained, well mannered boxer in rescue. For a variety of reasons the training efforts on the part of the former owner were not successful. Sometimes it isn't the owners fault. 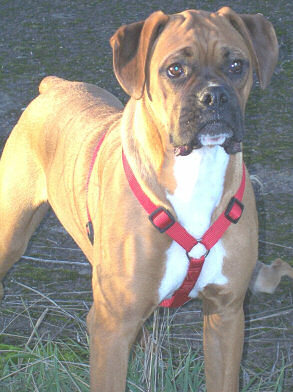 They may not have been prepared for the stubbornness or intelligence of the boxer. 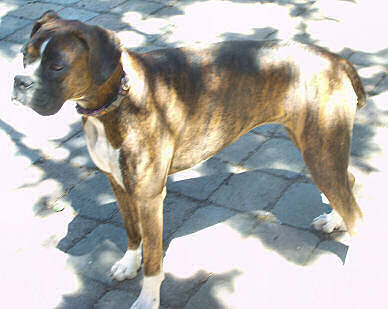 Or they may have been convinced certain "new way" training techniques would be sufficient for their boxer. The “all food” motivation way of training. The “lack of consequences” way of training sometimes lacks the necessary leadership a boxer needs to be a well mannered pet. Please interview the trainer you are going to train with. (Training your rescue dog should be a requirement.) Training, preferably with a private trainer but classes for sure if nothing else. For more information please check out my training page. Brief summary of my training philosophy. I use treats to teach. I don't believe in force training. I do not, however, use treats to eliminate behavior problems like jumping up, biting, barking, counter surfing, aggression. I do not use treats as a bribe for good behavior rather as a reward for good behavior.. There is a huge difference between reward based treat training and bribery. And, even for training there may be a point where the dog must learn the behavior is mandatory not optional... treat or no treat. Apologies if any of these dogs are no longer available. Unfortunately people don't always let me know their status. 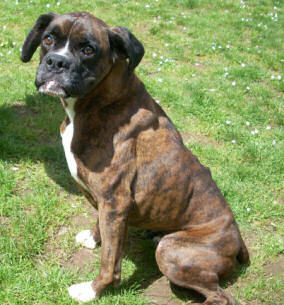 Five and a half year old Bella is a spayed boxer girl whose owner is losing her home. 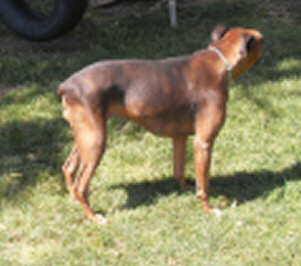 Her owner says, ""Bella is well-trained, knows all basic commands plus some tricks. She is very mellow to the point that you can sometimes forget she’s in the room with you. She is a solely indoor dog, is very potty trained (I don’t think she’d go in the house if she were left alone for days) is crate trained, does not bark, dig or destroy anything. She loves anyone that will pet her and has a lovely outgoing personality." " Bella has had no health issues at all. "Bella gets along with other dogs of all sizes and ages very well.Bella gets along wonderfully with children of all ages. " Bella is a n incredible girl. She is a total DIVA and loves to dress up in dog coats or have her nails done. She has a happy heart and does the “Boxer Dance” whenever we come home, even if we were only gone for a few minutes. Bella knows when you’re sad and will do what she can to lift your spirits. She knows she’s not supposed to lick faces, so she’ll lick the air in front of her while enjoying a good scratch. There is no limit to the love in this sweet girl." 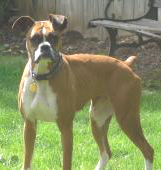 Bella is located in Eugene. Contact Trifecta Training Center at trifecta_training_ctr@yahoo.com for more information. I answer all inquiries. 11 week old Blind fawn male. Pictures to follow soon. Rescued from the street. YEs, they can be trained. He all ready follows a voice. The blind and the deaf puppies train well with a vibration collar. Is it easy....no.. possible yes. They can be taught to tell you when they need to go outside without being able to see where they need to go. He is very cuddly and often blind puppies are very tuned in to keeping track of their people. Because he must have been blind from birth he will learn to adapt quicker to his surroundings. He is in the Portland area. STATUS UNCONFIRMED SUPPOSEDLY PLACED UNABLE TO VERIFY..... Jodi is a 2 year old who gets along well with children and small dogs. She knows some commands is crate trained, housebroken. She is spayed, chipped and up on her shots. She was having some issues with the other female cattle dog in the family. To other dogs she appears fine but may have some minor aggression issues. She seems calm not hper at all like some young boxers. She is a very sweet affectionate girl. Zoey is 4 years old and is spayed. (She is curently at Kill shelter in Corvallis) Below is the shelter evaluation. "The people who surrendered her had her since she was a pup and just recently has become snippy at the older dog that lives with her and likes to bark at dogs and cats that walk past their house. The people lost there home and were afraid it would be harder to find a new home if they still owned her. They were going to have her euthanized but we felt that her issues could be dealt with. We did our evaluation on her and we saw no aggression with her toward people, her food and was appropriate with dogs, but given her history we cannot place her for adoption. 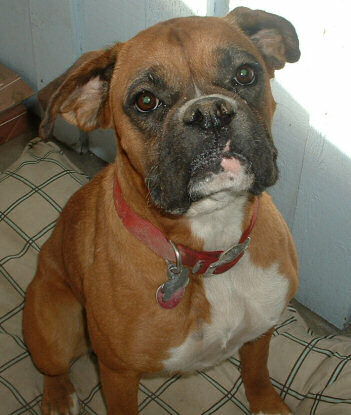 She is super playful, wiggly and loves to give kisses, basically your typical Boxer. Her surrender form said that she has lived with children, but did not list their ages. She is a little hesitant when meeting men, but the second they play with her and give her treats she is in their lap and wanting to play chase. She is crate trained and very housebroken. Her surrender form said that she becomes a guard dog at home and protects the house. 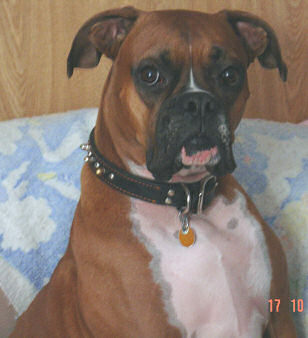 She is a very gentle boxer that even when she gets excited she does not try to jump up on you and try to knock you down." Contact me Pat Russell at trifecta_training_ctr@yahoo.com for a application and contact info. I am offering one free training session for her. I feel it is mandatory for her safe and appropriate adoption. Two boxers who have been together for several years. A male and a female....one four and one five. One white and the other fawn. Spayed and Neutered...Good with children and cats and other dogs. Nicely mannered. Pics may be available in a few days. Contact Pat at trifecta_training_ctr@yahoo.com. I respond to all inquiries. 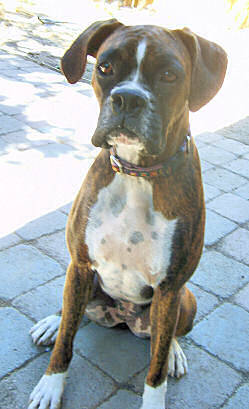 Bo is a Five year old boxer male. He is neutered, loving with people but not with other pets. He was left at a local boarding facility. They apparently want a $75 adoption fee. We don't normally advertise rescue who require adoption fees but I think this is to help pay for the cost of his care. she was adopted from two college girls but the young man who adopted her cannot keep her. and dishes, I am completely housebroken. I love to play with Doc and Puppy Rose. Please if you think I would be right for you call my now family. Because they are looking for a special home for me. Did I tell you I like to open cupboard doors with my teeth, I am very smart. 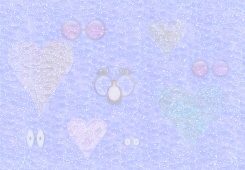 Please give me a look see. I will love you forever. Sasha. Toby a 13 month old neutered male. He is getting out of the back yard and causing trouble with the neighbor dog. His owner writes "we have had him since he was six weeks old. He has always been crated and house-broken. He walks on a leash, loves to fetch his duck, and he knows sit, down, crawl and we are working on stay. He has been fixed and is up on all of his shots. He has slept in his crate, but prefers to sleep next to our son on his own bed." 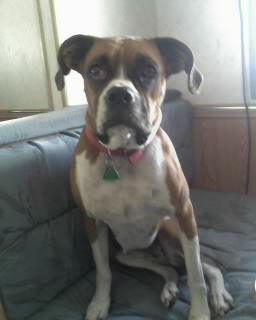 I have a 3 year old female boxer named Jasmin that is friendly and has tons of energy. Like a typical boxer, she wants to be around people as much as possible and will follow you everywhere in the house. She is very spoiled and wants to sit in your lap on the couch and sleeps in my bed every night. She is not getting along with my other boxer and needs to be the only pet. She also needs to be “re-socialized” as I have kept her in my house and yard a lot as she does not get along with other dogs. She is not a dog for the dog park. She is very trainable for someone that has a lot of time to give her. She has been in a house with children before, but due to her strength and all her energy, it would probably be best to not be with young kids. She is house broken and spayed. She gets very excited when first meeting people. Please email or call me if you are interested and explain your situation to me. I will not let her go to just any home. 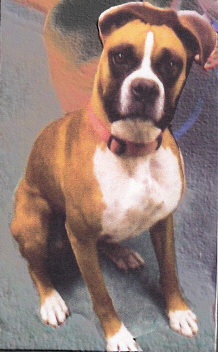 Please note this boxer girl needs training both for her bonding, obedience and socialization. Securely fenced yard mandatory. This is a Mother and Daughter It would be best if these two girls could go together. Central Oregon, 40 mile East of Bend Mindy was a one year old breed dog living in filth in a box with room only to stretch and poop. 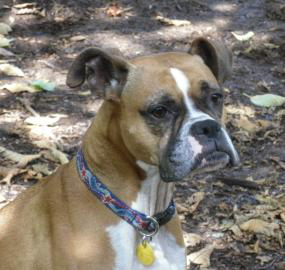 Mindy's a sweet dog but needs a family that can work with her. She chases cats, chases cows and killed a chicken. She is going to be spayed and she weighs about 40 pounds. She was a rescue so it is unknown how she is with children but she would be best with adults or older children and no other dogs atleast until she has been properly trained and learned some social skills. Placed June 10, 2008 Male, fawn, neutered. Found wondering in Bend area. (Prineville) Young probably around a year (guestimate only.) Seems good around other dogs but is protective of his food with dogs. Good around strangers...good on leash. Knows "sit." 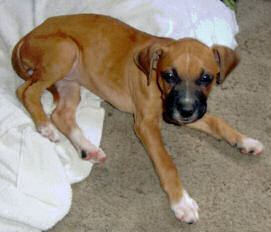 Placed June 7, 2008 Two boxers at Lane County Animal Regulation one female one male. Both fawn both uncropped. The male is neurtered and he weighs 65 pounds friendly and alert. 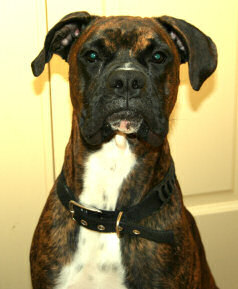 He appears to be quiet but also independent and can be dominant toward other dogs. 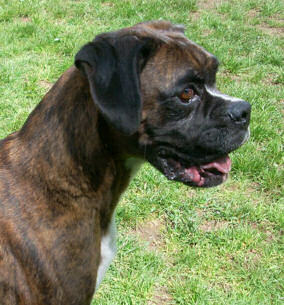 The female is full of life, she is a very happy dog friendly, alert and quiet. She is 50 pounds. Duke is about four years old. His family has to move and they cannot take him where they are going. He is well mannered around other animals. Current vaccines. Ok with cats and other dogs. Loves people and is good around children. He does have a partially torn cruciate ligament that is ok but requires some meds occasionally. Message from Duke: Let me tell you what I am looking for in my best friend. I love men that want to play ruff and sleep hard I am a boxer and that is what I live for. If you have a yard even better. I like kids but love older ones that can hold their own with me. I am cool with other animals I do love being around people more. So if you are single and need a friend I am your guy. A family would be even better. Please help me out here and make my mommy feel better about having to give me up. Dec 2007 Nine Month old males both neutered, good with cats, kids and dogs. Current vaccines. Need training. Also there are several new rescues in the Portland area both male and female. Also a 2-3 year old fawn male. Contact Jaque see email above. Traveler is ten months old, very active, needs training. He is crate trained. He knows sit and down but needs work on leash and manners. He is good with children but a little too much with younger children. He is good with other dogs. He is good with cats but plays too hard. 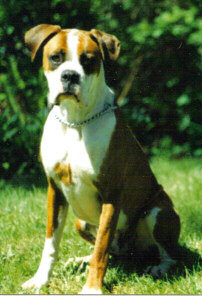 He is a typical well bred, good looking boxer who was not given enough training in the beginning. Please write to trifecta_training_ctr@yahoo.com for an application. October 11, Update....Carter is improved greatly after three visits to the PT. 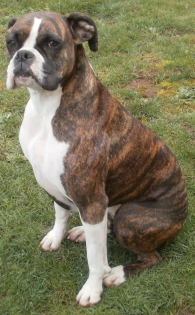 Male 10 Months Old. 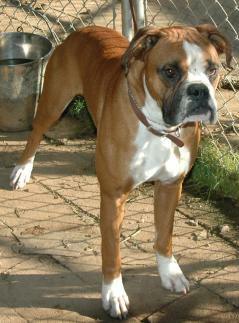 : Carter is a very sweet male boxer who is currently at Greenhill Humane Society. He has a medical problem that is causing him not to be able to control himself when it comes to defecating. He is a little unsteady in his hind quarters. Probably associated with the problem . It is not known for sure what is causing the problem. He has visited South Hills Physical Therapy Clinic twice and they feel the problem can be fixed. And they are willing to do the work for free. I have been working with a therapist at the clinic for a couple of years both with my own back proble ms and with some of my dogs. They are very very good. 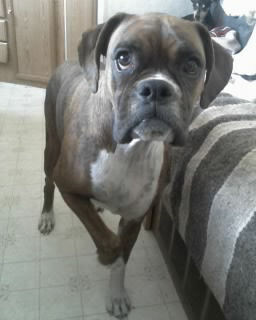 The problem is we need a home or a foster home for him in the Eugene Springfield area. The foster home or forever home would need to be able to get him to the PT Clinic for his sessions approx every other week or as available. They are working him in when they have an availability. 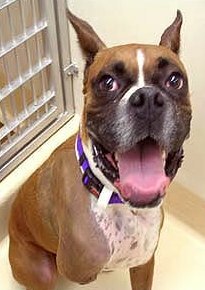 He is a happy sweet natured guy and that is why we with boxer rescue and Greenhill and South Hills PT clinic are doing everything we can to get him well. But we need help. Even help getting him to his sessions would be appreciated. He does ok riding in a crate. Contact Ashlee at Greenhill 689-1503 ext 116. Or contact me Pat Russell, Trifecta Boxers & Training Center 541-935-0112. To his forever home he comes with two free private training sessions here at Trifecta. October 5, Male,PLACED Forest Is between 3-5 years old. He is a friendly and very social guy. He is ok with children, cats and other dogs. He is a lean 59 pounds and although not mentioned in his bio he has probably(?) been neutered. 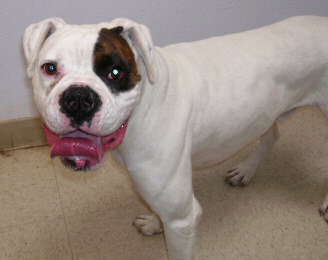 He is currently in the Troutdale Animal Shelter. This is a Kill Shelter and hopefully Forest will have about ten days. 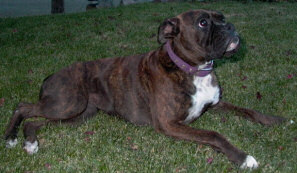 Molly is a 10 month old flashy brindle spayed boxer, Born: 10-26-06,AKC registerable (papers available to fill out).One owner has had her since 7 weeks of age. 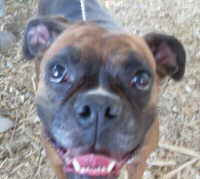 Molly gets along exceptionally well with a 5 year old female boxer, and is submissive to two female 1.5 year old boxers. 1. She sits on command, will "stay" if not distracted. She goes into her kennel on command (likes treat once inside). 2. Understands "no" or "leave it". 3. Comes to clicker sound (in fenced back yard - not trained to open area). 4. Barks or goes to back door when needs to potty. 1. Gets excited with newcomers and will jump up; stays off people who make it clear "no jump". 2. Chews a lot - please provide toys; must reinforce "no" or "leave it" with items you don't want touched, like shoes. 3. Walks on leash without pulling if you use a pinch collar. Anticipate with training she will not pull with regular (slip) collar. Medical: Spayed at 6 months. Current on all puppy vaccines (x 3 doses), bordatella and rabies. Only chronic condition is mild urge incontinence which is controlled with medication [Oxybutinin 5 mg twice a day; costs $10.00/month at Costco; can probably stop it at 1.5years of age]. Personality: Energetic, playful, very intelligent and learns quickly. Meals: Fed twice a day: Mixture of 1.25 cups dry NutroMax lamb and rice kibbles, and 1/4 can of Science Diet lamb & rice moistened with warm water at each meal.It is possible with a change in diet the urgency condition will go away faster.And she can come off the meds quicker. Molly needs more training as she can be other dog aggressive when on leash and meeting strange dogs. Molly has not been around cats. She likes children but will jump up on them without adult supervision. She comes with three free training sessions here at Trifecta Training Center. She is with her owner in Portland but the training is here in the Eugene Oregon area. August 15, 2007 Katie is one year and eight months. She was born on new years. Her ears are not cropped. 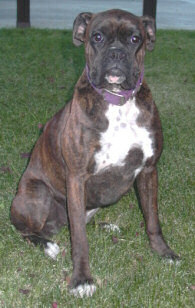 She is brindle with white chest and paws. She is spayed with a chip. She is crate trained. She chases cats but does not hurt them. We have two cats. She tends to dominate other dominant dogs by holding them down. She plays loud but she has never hurt another dog. She is up to date with he shots. She has had this year's rabies shot. We did purchase her from a breeder and we have her papered info.All of her training has been at home basic skills sit, come, laydown, no, down, and she is house and vehicle trained. Katie is being rehomed because she is showing aggression toward the children. She would require dedicated training to make sure this behavior is eliminated and it is suggested she not be placed with people with young children. Or be exposed to children before she has been trained and tested. Canine Good Citizenship Cert. She is located in La Grande. If you rescue this girl I will offer two free training sessions for her here at Trifecta Training Center. 20 months old, fawn, neutered, has had some training. Weight around 65# slightly underweight but will fill out more. Must have fenced back yard. He is going to need some training before he is trustworthy around other stange dogs. He comes with three free, hour and a half training sessions with Trifecta Training Center. He is good around school age children. Has not been exposed to younger children. He sleeps loose in the house on his bed. Contact Bill 503-398-6260.Tillamook area transport available. 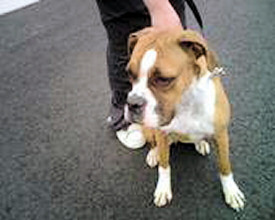 RC is about 3 years old, fawn, neutered boxer male. He weighs 49# of average boxer size. He is very very underweight at this time. 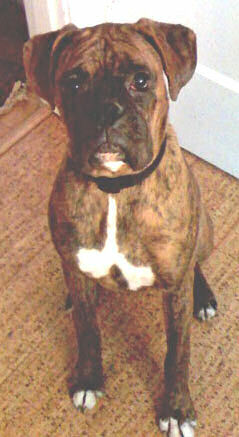 He is a sweet affectionate boxer. He is good with other dogs and seems fine with an older child and maybe fine with yougner as well. He has had all his shots and has had regular vet visits. He is gaining weight now that he is getting good food and proper care. 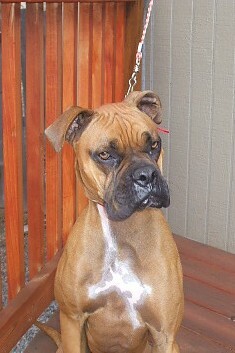 Sam is a 17 month old red fawn, neutered boxer male. He weighs 71# of average boxer size. He is a sweet guy. At first assessment he does not seem to be a dog that jumps up on people. He is not a hyper dog. He knows sit and seems cooperative around the house. When walking on leash he seems to be reserved, and with out meeting other dogs he doesn't pull. He really wants a family of his own. He has had all his shots, worming and has been well taken care of. He sleeps quietly in a crate. He is the most attractive boxer I have ever rescued. He isn't aggressive around my dogs. It is unknown how he is with cats and children but he is very mild mannered. He doesn't seem aggressive at all but was allowed to run and was chasing livestock. 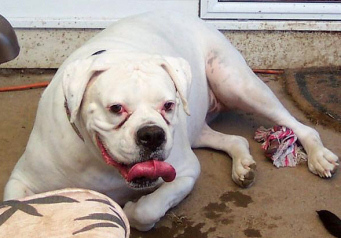 Big Max is an active and playful dog even missing one leg. His right front foot was broken upon arrival. We sent him to NPAH and they were unable to repair it and had to amputate the leg. Big Max is an intelligent dog that responds very well to training. He does pull when walked on leash. Big Max will need a home with no cats. The home that fostered him during his recovery had cats and he kept trying to chase after them. He will make someone a great indoor companion dog. shelter location: 1067 NE Columbia Blvd. Fawn male, neutered, uncropped, 4 years old, knows basic commands, walks on leash without pulling, well mannered, good with other dogs, good with people, maybe dominant with small children. In Medford. Contact Pat Russell 541-935-0112. 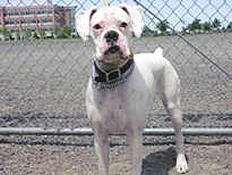 White female, one year old, high energy, some training...contact Karen Churchill 503-654-7661. 'Nuff" Five year old golden brindle male. 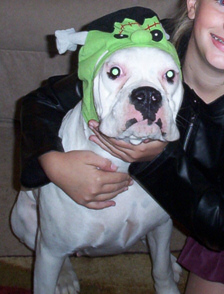 Trained, cropped, good around children, Aggressive with cats, female dog ok. Contact Karen Churchill, 503-654-7661. 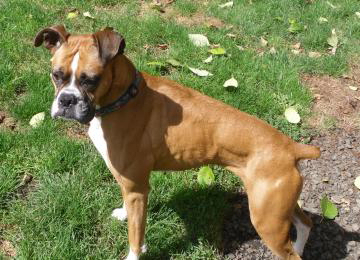 Older Fawn boxer girl is currently in the Salem shelter. This information was sent to us by a friend of boxers. Click on the link to go to her page. Very sweet black face fawn male. Uncropped, unneutered 8 year old. Is in good health. Owner is in a divorce situation and having surgery and cannot continue to care for the dog. Keep in touch with your local humane societies. This rescue effort is a referral service for those who are interested in adopting a boxer dog who needs a home. 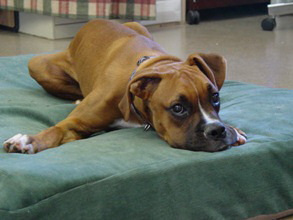 A service to help boxers find good permanent homes. Until recently we had a wonderful lady who was our rescue coordinator. She has had some personal problems and cannot do rescue full time anymore. So Karen Churchill and I, with the help of others, interested in helping boxers who don’t have homes, are going to try to fill in for her. This will not be easy for us. We all have very busy lives. We will attempt to screen potential dogs and owners as best we can by phone. The final determination of the correct dog will have to be done by the family that is considering adopting the dog. 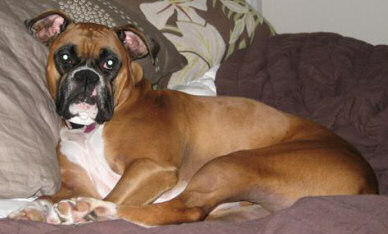 We appreciate the cooperation and patience of those interested in adopting a boxer. This includes keeping us informed. Please read some of the requirements for adoption. 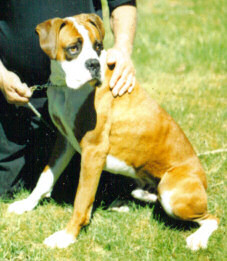 1 A willingness to train the boxer regardless of how well the dog is all ready trained. 2 A secure fenced enclosure of at least 6 feet in height. 4 A desire & financial ability to provide a secure loving home. This includes, but is not limited to, veterinary care as needed & yearly checkups. Spay or neuter. We will endeavor to place dogs without putting them in a foster situation. For this reason we will not be doing an evaluation of their temperament. Those who get a referral from us will have to assess, on their own, whether the dog is appropriate for their families.